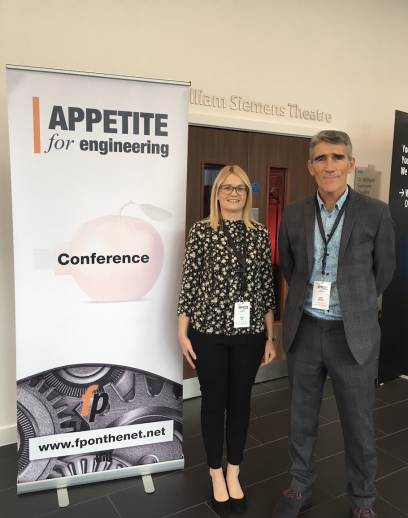 Winkworth, the UK’s leading designer and manufacturer of industrial mixing and blending machinery, took to the stage at the recent Appetite for Engineering 2018 conference, to present a paper aimed at improving the advice and guidance given to young people in their career choices. The annual conference, held on 18 October at the Manufacturing Technology Centre, Coventry, provides a forum for senior executives, experts and peers from all areas of the food and beverage production sector, to discuss challenges, opportunities and share matters of mutual interest. During the ‘people and skills session’, Winkworth’s managing director, Grant Jamieson, together with his HR manager, Jessica Holt, delivered an argument suggesting that young people too readily seek career opportunities with large corporations having been enticed by their corporate branding, the prestige and glamour of the products they offer, but not necessarily focused on the personal work experience they will actually get within those organisations. On the flip-side, SMEs, who employ a significant percentage of the UK workforce, are missing out on the talent pool, despite being able to offer a greater diversity of work experience. The presentation called for a better focus on what is right for the individual – whether as a student making career choices, or a graduate looking to develop his/her experience. In supporting this decision making process, corporate entities should, in turn, provide an honest and realistic appraisal of what they can offer through their apprenticeships, internships and work placement schemes, whilst SMEs should seize the initiative and actively promote themselves locally, working closely with schools and universities to inspire students. The presentation was well received at the conference and has since led to an invitation from Portsmouth University to share the presentation with 200+ aspiring mechanical engineers early in 2019. Backed by a loyal, skilled and long serving workforce, Winkworth recently achieved a ‘Highly Commended’ in the PPMA Best (Business, Education, Skills and Training) Award, in recognition of their investment in young people through industrial placements over the past 7 years. PPMA Best is a charity established in 2014 to encourage young people to enter and develop a career in engineering within the processing, packaging, robotics, automation and industrial vision supply industries through education, training and support.